Cosmetic Surgery Blog & News | P. Craig Hobar, M.D. After the devastating earthquake that struck Haiti on Tuesday, January 12, 2010, the need for a cohesive effort to address acute surgical care was brought to the forefront of the media as never before. The magnitude of the earthquake and the lack of well developed infrastructure in Haiti coalesced to reveal the need for better planning and implementation of emergency surgical response. With a team of local physicians, Dr. Hobar traveled to Haiti and was performing operations the Saturday after the earthquake struck. Over two years later, Dr. Craig Hobar and the LEAP Foundation continue their commitment to the long-term needs in Haiti. 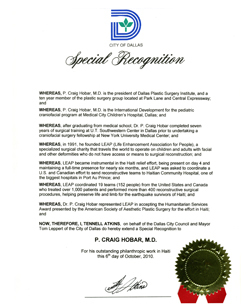 In addition to media exposure for his efforts there, Dr. Hobar was honored with this special recognition from the City of Dallas for his philanthropic work in Haiti. Dr. Hobar has been asked to share his expertise in rhinoplasty with fellow plastic surgeons by writing a chapter of the upcoming Clinics in Plastic Surgery featuring rhinoplasty techniques. Dr. Hobar has had an interest in rhinoplasty and particularly achieving balance in facial features through rhinoplasty by establishing ideal nasal length for a particular face. Dr. Hobar was recently asked to present his work with LEAP at the Building People Building Dreams conference in Atlanta, Georgia.